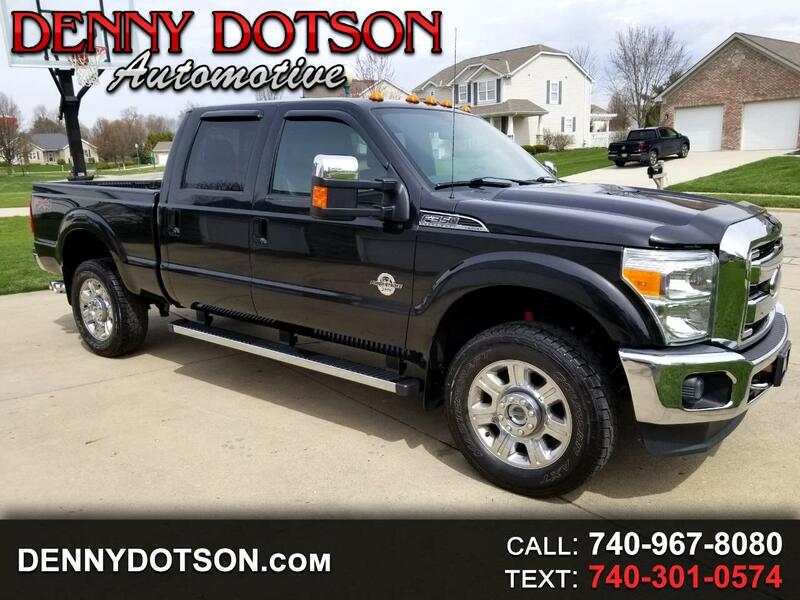 Used 2014 Ford Super Duty F-350 SRW 4WD Crew Cab 156" Lariat for Sale in Johnstown OH 43031 Denny Dotson Automotive Inc.
One family owned 2014 Ford F-350 Single Rear Wheel Crew Cab Lariat 4X4 with only 50K miles. Clean history with no stories. Optional equipment includes heated and cooled seats, 6.7L Powerstroke Diesel, 3.55 electronic locking axle, rubber mats, chrome package, chrome steps, FX4 Off Road package, rapid heat supplemental heater, engine block heater, 5th wheel hitch prep package, roof clearance lights, wheel well liners, chrome clad cast aluminum 20" wheels, upfitter switches, heavy duty alternator, and Lariat Ultimate Package(Navigation, Power Moonroof, Memory Group, Remote Starter, and Tailgate Steps). Tuxedo Black Metallic over Black leather. Awesome truck all the way around. The right colors and the right options. Comes complete with all of the books, manuals, both sets of keys, and original window sticker.